Israeli Tourism Minister Yariv Levin has revealed that the goal of the upcoming Israeli government is to settle an additional one million Jewish settlers in the occupied West Bank, Quds Press reported yesterday. The Arabic site said Israeli news website 0404 revealed that Levin made his remarks during a meeting with the Chairman of Samaria Regional Council Yossi Dagan in the occupied West Bank. “We agreed on reinforcing settlement, accelerating building and creating a situation where settlement does not grow, but develop very fast in order not to meet the needs of the settlers, but to meet the developing settlement,” Levin said. Our goal is to settle one million more settlers in Judea and Samaria [the occupied West Bank] and this must be achieved in a very short time. According to a statement made by the Israeli Housing Minister Uri Ariel in May 2014, the number of the Israeli Jewish settlers was 750,000. He said that 400,000 lived in the occupied West Bank and up to 350,000 in occupied East Jerusalem. Israeli police kidnaps a Palestinian child, Occupied WestBankOn Monday morning, the Israeli police shot injured a Palestinian man and abducted two children during a raid on Abu Dis town in occupied Jerusalem. Violent clashes broke out between Palestinians youths and Israeli police forces as the latter deployed around al-Quds University, local sources reported. Israeli police stormed into a school and fired tear gas bombs and stun grenades. The Palestinian Red Crescent Society said that a Palestinian young man fainted as a result of inhaling tear gas and was treated in the field. According to the Palestinian Liaison, the Israeli police withdrew from the town after kidnapping two children identified as Ezz el-Din Mohsen and Sami Jaffal. Both are aged 15. The Israeli occupation forces “IOF” threaten to demolish two Palestinians structures in al-Khalil southern of Yatta under the pretext of unlicensed construction, on Monday. Coordinator of the popular anti-settlement committee, Rateb al-Jabour, said Israeli soldiers stormed Khilet al-Dabaa’, in Yatta, and notified the demolition of a residential facility owned by the Palestinian citizen Mohamed al-Dababsa. The occupation authorities also threatened the demolition of a residential room belonging to Isaa Ali Awad in al-Touba area, in Yatta, under the same pretext. The Palestinian Center for Development and Media Freedoms (MADA) condemned the wave of arrests and detentions carried out by Palestinian security services in the West Bank and the Gaza Strip since the beginning of 2019. These violations have affected nine journalists, (as well as a number of other journalists who have been exposed to the same violations in late last month in Gaza). They are: from the West Bank, Yousef al-Faqih, Mahmoud Harish, who was detained for 22 days and released two days ago, Zaid Abu ‘Ara, the media student at Birzeit University Hamzah Mahmoud Khader, Hazem Nasser, Metasim Sakf Al-Hait, Amir Estate and Faisal Rifai, whose freedoms were held for hours. And, from Gaza, Louay al-Ghoul, who was summoned and detained three consecutive times for long hours by the Internal Security, during which he was tortured and beaten. The Preventive Security Service, for example, arrested Yusuf Mohammed al-Faqih, a journalist for Manbar al-Horiah, a local radio station in Hebron, and working also in Quds Press news agency, after raiding his home in “al-Burj” village, near Dura city in Hebron, on charges of “inciting sectarian strife”, according to his father. On January 28, 2019, Yusuf al-Faqih was transferred from Dura’s prosecution to Ramallah prosecution without an investigation. A request was submitted to the Ramallah Magistrate’s Court, to extend his detention for 15 days, despite a submission of pleading by MADA’s lawyer. The court decided to detain him for 15 days, and he was still being held at the headquarters and prison of the Preventive Security Service, in the town of Bitunya, at the time of this report. The situation in the Gaza Strip was not different. Within a wave of summonses and long-term detentions of a number of journalists, the internal security service of Hamas, for example, summoned the journalist Louay al-Ghoul three times on 6, 7 and 8 January, and subjected him to ongoing investigation and interrogation and detention for long hours, each time, as he was beaten and tortured, during which his head was placed in a plastic bag after being transferred to an interrogation room. He was additionally assaulted and beaten, with hands and whips, on his shoulders and thighs area after removing his winter jacket. The Palestinian Center for Development and Media Freedoms (MADA) strongly condemns this wave of arrests and violations, and reiterates its call to the competent authorities, to work to stop all these violations, release all the journalists detained by the security forces, and investigate the incidents of abuse, with special note to what the journalist al-Ghoul was subjected to, during his detention. Israeli forces took into custody some 380 Palestinians, including 5 women and 67 children, in January of 2019, the Palestinian Prisoners Center for Studies said on Saturday. In a statement, the Center explained that Israeli forces detained 12 Palestinians in the Gaza Strip, including 5 fishermen who were kidnapped while sailing off Gaza shore. One Palestinian youth was detained at Beit Hanoun (Erez) crossing, and 6 others were taken while allegedly attempting to cross the border fence east of the Gaza Strip. The Palestinian Prisoners’ Center said that, in January, the Israel Prison Service launched a crime, against Palestinian detainees being housed in Ofer jail, that was described as “the most dangerous” since the 2007 attack in Negev prison. According to the statement, dozens of Palestinian detainees suffered bruises, wounds, and fractures as a result of being beaten, sprayed with gas, and hit with rubber-coated metal bullets by the Israel prison guards. During the same period, the Israeli occupation authorities issued 55 administrative detention orders, issuing 18 new ones and renewing the detention of 37 detainees for 2-6 months, Days of Palestine reports. Editor’s note: Administrative detention is an archaic legal procedure, dating back to the days of British Mandate, in which detainees are imprisoned without charge or trial, for renewable periods of up to six months. 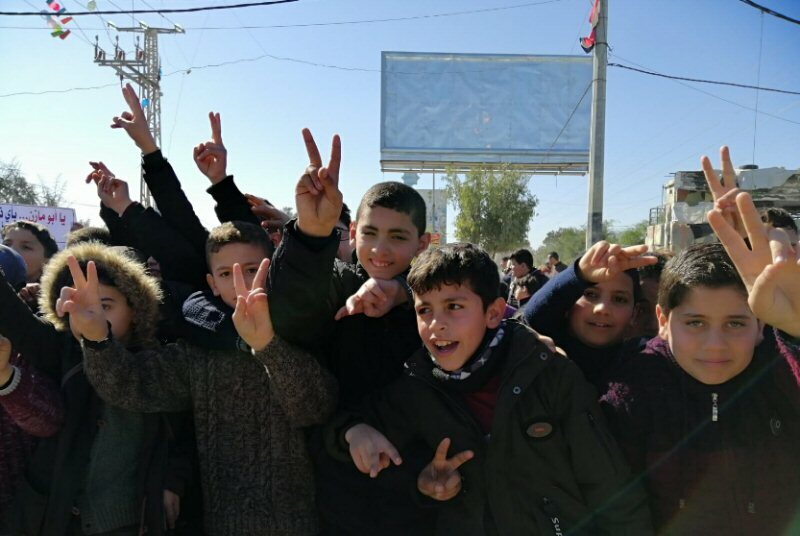 Hundreds of orphans from the besieged Gaza Strip gathered near the Erez Crosing, in the northern Gaza Strip, to protest the cutting of their families’ salaries. The orphans, victims of decades of living under Israel’s illegal draconian siege, have been left under miserable conditions in the coastal enclave, without any source of income, a local source reported, according to Days of Palestine. They are calling for ending the 12 year-old blockade imposed on Gaza. They are also protesting the measures that have been taken by PA president Mahmoud Abbas, and calling on him not to hinder the struggle for their basic needs, and to not stand beside Israel in punishing them, the source added. 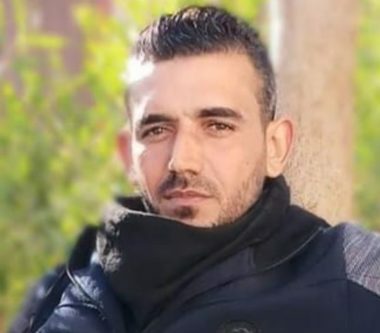 Ahmad Ghazi Abu Jabal, 30, died of critical wounds he sustained last week, after being shot by Israeli forces offshore the town of Beit Lahia, north of Gaza. Abu Jabal, from the Sheja’eyya neighborhood east of Gaza city, was shot and seriously injured, on January 29 2019, during a naval procession along Beit Lahia Sea and shore, in northern Gaza. The soldiers who shot him with live fire were stationed at the Zikim military base, near Gaza’s northern border. The Democratic Front for the Liberation of Palestine (DFLP) issued a statement mourning his death, and declaring that he was one of its members. 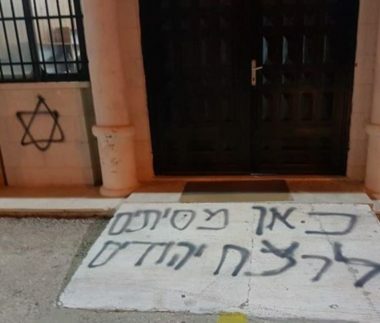 A group of illegal Israeli colonialist settlers infiltrated, on Monday at dawn, into Deir Dibwan village, east of the central West Bank city or Ramallah, and defaced a mosque and several cars parked nearby. Mansour Mansour, the mayor of Deir Dibwan, said the colonists defaced the walls of the local mosque, and several cars, with racist graffiti. He added that the illegal colonists have been escalating their crimes against the Palestinians, their homes and lands, and their holy sites, and are encouraged by the inaction of the Israeli occupation forces.